Just as the Wild West in the 1800’s and the era of Electronic Commerce (e-commerce) required the landscape to be tamed for consumption by consumers, Mobile Commerce (m-commerce) must wield its’ way to find the same practical solutions to garner consumer acceptance and realize substantial growth. The capability of m-commerce reaching the same market penetration as e-commerce is going to require different models and technologies. Armed with the knowledge obtained from our e-commerce failures’, finding solutions to a market of 200 million users is an extremely lucrative venture. To disregard the quest of finding viable business solution for this market is not an option. The slow down of m-commerce growth over the last 4-5 years is inline with the maturation process required from both a technological and business perspective. A process comparable to the beginning stages of when the Internet and e-commerce era emerged. Growth in this market will be significant over the next five to seven years as these emerging technologies and business models prevail in generating a value driving consumers towards mobile commerce. A brief understanding of the definition and potential revenue of m-commerce is required to properly set the foundation of the above theorem. Laura Abbott of MobileInfo best summarizes the definition of mobile commerce as “any electronic transaction or information interaction conducted using a mobile device and mobile networks (wireless or switched public network) that leads to transfer of real or perceived value in exchange for information, services or goods”. This definition provides of how globally ubiquitous transaction computing is to become as we continue our growth progression with technology in society. This is an overarching result of a cultural transformation of being static in the consumption of information, to being continuously connected from any device, at anyplace, at anytime to process information. It is important to understand the term “mobile device” and “network” is not quantified in describing a specific technology and its revenue potential. Mobile commerce revenue can be speculated based on the number of mobile devices in the United States. According to Michael Becker, CTO of iLoop Mobile, “The industrial nations are approaching a saturation point with 70% of their populations subscribing to mobile services.…the United States will have 214 million subscribers, 71% of the population, in 2006” (3). These numbers alone can be extrapolated into spreadsheets exasperating an explosion of volume based on any conceived revenue model. A simple example can easily validate an overstatement of expectations. If a business could capture just .5% market share of the population who use mobile services with a ten dollar a month subscription based service, the business would gross 120 million dollars in annual revenue. An over zealous entrepreneur or market analyst could easily account for one million subscribers in their business plans. Valuation based on a vertical market does not automatically transcend in a different market. This is validated when you look a market penetration of mobile devices in the United States over the next four years as provided by eMarketer (see Fig.1). The number of cell phones and market penetration leads you to believe the valuation of m-commerce would follow the same market growth. The growth potential is real, but the reality needs to be aligned with development of new technological and consumer adoption, and not the performance of other markets. Fig. 1. “Mobile Spending in the US”, Chart. Global Technology Forum, The Economist Intelligence Unit Limited. 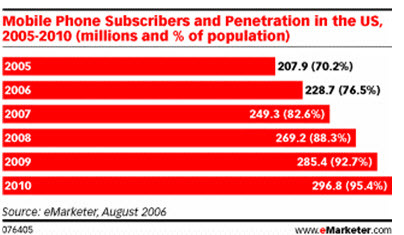 12 September 2006 <http://www.emarketer.com/images/chart_gifs/069001-070000/069566.gif>. So why has mobile commerce been so slow to adopt to the United States market? It seems that past barriers of m-commerce continually preoccupy business in waiting for the development of technology and services to ensure consumer’s would have confidence and capability to perform a mobile transaction. These barriers are very well defined by Tarnacha and Maitland in a paper titled Entrepreneurship in Mobile Application Development, “Mobile Commerce, unlike its cousin electronic commerce, has fallen short of its expectations in multiple ways . Researchers point to several reasons, including consumer trust  and indifference ; device usability [10, 21] and security [4, 22]; infrastructure dependability [13, 15], and business models [1, 15]” (589). Past historic technological events, such as the development of the Internet, induce a time continuum of failure as edification to allow success. From this perspective there are three key focus areas where technology needs to emerge as an enabler for the mobile consumer; (1) infrastructure capable for communication; (2) applications to entice the consumer to utilize the technology for m-commerce; (3) devices that enable consumers to conduct mobile transactions in a safe and secure manner. Is the infrastructure safe and secure enough to provide a stable and usable environment for consumers? The infrastructure currently faces a lack of standards and network speed as factors in limiting the growth of m-commerce (Abbott). Standards and network speed are two factors requiring improvement in their own discipline to enable m-commerce growth. Nokia further elaborates m-commerce environment as, “Mobile transactions can be performed in three environments – remote, local, and personal” (5). Remote environments provide a landscape of various wireless network and cellular telecommunication technologies. Local environments utilize device-to-device communication protocols, which include radio frequency identification (RFID), Bluetooth, infra-red, and Nokia’s new open standard called Wibree. Wireless specifications have had the luxury of being developed and managed by the Institute of Electrical and Electronic Engineers or IEEE. The IEEE 802.11 wireless standard enabled devices to be physically disconnected and be able to perform network communications. A trend of new development of this capability has created a new standard called IEEE 802.16 or commercially known as Worldwide Interoperability for Microwave Access or WiMAX (“WiMAX”). This new standard allows wireless networks to broaden their scope of capability and coverage area for mobile TCP/IP based devices. Cellular communications have not enjoyed the same luxury as wireless networks, and have disparate technologies deployed globally. United States cellular communication providers have invested into second-generation, 2G and 2.5G digital wireless telephone technologies. The new standard, 3G, are only being released this year and have not been fully implemented (Grami and Schell 1). As cellular development continues to support mobile commerce, Ali Grami and Bernadette Schell concludes, “4G systems with more security, higher speeds, higher capacity, lower costs, and more intelligent infrastructures and devices will help realize m-commerce applications” (10). Delivery of this new standard is projected to occur sometime around 2010 (Grami and Schell 1). If the infrastructure is capable of m-commerce, then what are consumers going to purchase and how? M-commerce has been waiting for broad consumer adoption of applications or otherwise known as “killer apps” to spur the growth in the usage of mobile devices. The term killer app applies to applications that either gain rapid adoption by consumers or provide the maximum value of revenues in a short amount of time (Gutiérrez and Xu). Today, m-commerce revenues in the United States are categorized into three segments; (1) messaging such as e-mail and text messaging; (2) entertainment in the form of video and gaming: (3) and information such a search and content web browsing. Combined, these three segments are projected to incur revenues of 5.4 billion dollars in 2006 and forecast to have 37.5 billion in 2010 (see Fig. 2). Fig. 2. “Mobile Spending in the US”, Chart. Global Technology Forum, The Economist Intelligence Unit Limited. 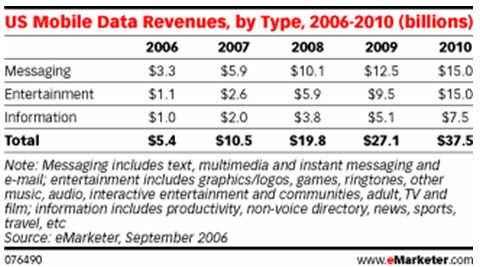 12 September 2006 <http://www.emarketer.com/images/chart_gifs/076001-077000/076490.gif>. These categories will continue to experience growth as m-commerce becomes established with consumers. Highly developed Asian markets are also seeing adoption of m-commerce applications as commented by James Belcher of eMarketer, “half or more of all mobile phone users use (and pay for) data services on their phones….And they are not merely buying ringtones, but a range of goods and services including real-world goods — actual physical products paid for with mobile phones instead of cash or credit cards, and picked up in person at convenience stores” (qtd. in Global Technology Forum). With Asia being at the forefront in the adoption of m-commerce applications by consumers, the United States business market will be forced into evolving around the established categories of mobile websites, location based services, and mobile-to-mobile payments. From an application perspective, there are new standards and services being developed and improved as m-commerce matures. Mobile web sites are becoming more accessible to the mobile consumers. In June 2006, 34.6 million (see Fig. 3) consumers have visited mobile web sites with Yahoo! Mail leading the way with 3.0% market share (Uncapher). The proliferation of mobile Internet web usage should also receive the benefits of new standards in programming that are currently in development by the World Wide Web Consortium or W3C. This new standard is called Web Interaction Compound Document or WCID and combines the usage of XHTML, CSS, and SVG for mobile web applications. This new standard enables application developers to build interactive web applications for mobile devices (Applequist). Location Based Services or LBS provide the ability for the consumer to perform a transaction for goods or services based on their physical location. This service enables ubiquitous computing based on local awareness as part of an m-commerce strategy (Steinfield 2). LBS application is not only being regarded for Business to Consumer (B2C) models, but also has awareness in the government for social and emergency positioning venues (LoSoNet 2006). Mobile-to-Mobile payments or M2M is another growing application that is evolving around m-commerce. M2M has the capability to transfer funds from one mobile device to another mobile device (Bushe). This enables the consumer to complete a transaction from a mobile device with a vending machine, a store, e-banking, or transacting money between two people. Key drivers to success of these technologies are low costs and convenience of usage (Nokia 7). With new applications coming from PayPal and Motorola and new players like TextPayMe, M2M could be the source of the industries next killer app. If the infrastructure and the applications can support mobile transactions, what are the security concerns to prevent consumer usage of this technology? In the United States there are major concerns over the security and identity theft in performing mobile transactions with the mobile wallet applications (Regan). These concerns extended through all components of a mobile transaction from a consumer perspective. Identifying these areas are complex, so the focus is to identify what important areas are being implemented to resolve consumer concerns. The first area of concern is ensuring the security of communication between the infrastructure and mobile devices. Consumers need to be assured that end-to-end communications are secure and data cannot be compromised. This concern has been resolved with the advancement of Wireless Application Protocol 2.0 or WAP 2.0 (see Fig. 4. ), which enables a method to secure end-to-end communication and is currently supported in mobile applications and terminal servers (Nokia 4). Fig. 4. “Connecting Mobile Consumers and Merchants”, Chart. Nokia Connecting People, Nokia Corporation. 2004 <http://nds2.ir.nokia.com/NOKIA_COM_1/About_Nokia/Press/White_Papers/pdf_files/connectingmobileconsumersandmerchants.pdf>. This model of secure end-to-end communication enables the usage of digital signatures for authentication and authorization to perform non-repudiation transactions (Nokia 4). A model that is very similar to securing e-commerce transactions on a personal computer, such as payment with Amazon or eBay. The Mobile Phone Work Group will work on the adoption of TCG concepts for mobile devices to enable different business models in market environment of open terminal platform. The work group will enhance TCG as needed to address specific features of mobile devices like their connectivity and limited capability as analyzed through various usage scenarios that may demonstrate added value of mobile devices in TCG (The TCG). This is important as this group just recently defined a specification for Securing Mobile Devices on Converged Networks. The specification emphasis details a framework to allow developers to build stronger security at the hardware level and minimize security risks at the software level (iGillottResearch 12). The consumer’s perception of today’s security implementation into the wireless environment is becoming more acceptable. A survey by AuthenTec in April 2006 showed over 58% of the respondents would want the same mobile services available to those in Asia and a majority would use biometric measures to secure their mobile devices for mobile transactions (Cygnus Interactive). The same survey also posted that 51 percent of those surveyed would use cell phones to enter sporting events, trains or subways, 51 percent would purchase items from a vending machine with their phones, 43 percent would purchase items from a store; 40 percent would use cell phones to conduct wireless banking, and 37 percent would use their cell phones to purchase books or music wirelessly (Cygnus Interactive). These results are very promising and are indicators of a trend that mobile commerce in the United States is gaining momentum. What are the concerns on device usability, and how are we going to perform mobile transactions on such small mobile devices? The ability for the consumer to interact with a keypad and navigate a menu system on a mobile device becomes daunting and frustrating for many (Baker). Baker also suggests that there is a problem in understanding that usability is more about the physical and interactivity of the device than it is about a software issue (Baker). Jacob Wobbrock of the School of Computer Science at Carnegie Mellon University identifies four trends related to an increasing need for Human Computer Interaction (HCI) studies as usability of mobile devices is not well suited for the baby boomer generation, lifestyle, business, and health situations require more time accessing content, services, and goods away from a desktop computer, necessity for constant mobility promotes portability and convenient mobile devices, and convergence of both mobile and desktop computing into a single device (Wobbrock). The industry has persistently adapted old technologies to solve mobility’s ability to interface with the consumer. What Wobbrock displays is a need for industry to realize these trends are an indicator of academia and consumers are demanding higher usability. There are usability technologies available that require further maturation, but there are also new technologies researchers are developing to enhance the usability of mobile devices. Perception technologies require enhancements, such as speech based interface (SBI), computer vision utilizing cellular cameras, and optical character readers (Canny). A new usability concept called context-aware interfaces is under development. This allows the mobile device to determine the type of content is to be delivered to your mobile device based on your location or position on the earth (Canny). Businesses are allocating research and development funds for usability studies with these technologies. Motorola Labs has a division to study and develop new technologies in regards to human interaction and to further integrate context awareness and perception interfaces. Some new products that come out of this division are Finger-Writing Recognition and Workload Management and Drive Assistance applications (Motorola Labs). The board scope of mobile commerce exemplifies the complexity awaiting the consumer in performing a single mobile transaction. This complexity is the reason why the United States has fallen behind both Asian and European markets in the adoption of mobile commerce. An exciting prospect for future growth is that all the areas defined do have strategies in place to enable more United State consumers to participate in a mobile transaction and become part of the global mobile commerce. Theses markets are seeing a natural growth of a complex and integrated technology. This example is clearly defined in Creating Successful Entrepreneurial Ventures in IT by U.N. Umesh, Minh Q. Huynh, and Len Jessup in determining market profit projections (see Fig. 5.) 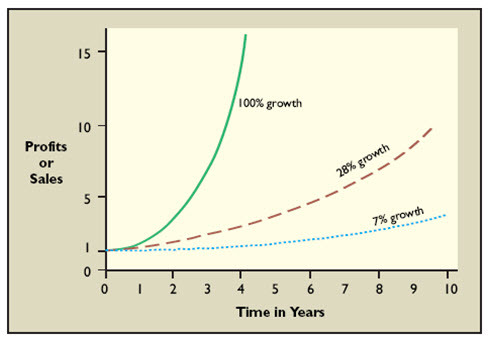 by sales or profits for various growth rates over time (Huynh, Jessup, and Umesh 84). This chart symbolizes the similarities of an entrepreneur looking for a quick growth market and a market that contains continuous growth. A well balanced market taking 10 years to mature with a growth rate of 28% has a valuation of a factor of 10 (Huynh, Jessup, Umesh). Mobile commerce is aligned with normal market maturation, which is not beyond its means, or like the valuations of markets during the dot-com era. As the wireless infrastructure, mobile devices, killer mobile applications, mobile-to-mobile payments, secure transactions, and easy-to-use interfaces become more apparent in our society, the United States market continues to improve its position in mobile commerce. Consumers can obtain ease-of-use and convenient method of conducting a mobile transaction and the market sustain its current growth rates. An external factor that has recently developed, is, the advent of the convergence of technologies between mobile and fixed computing. Two areas prepared for this convergence is the introduction of Voice over IP (VoIP) to cellular phones and dual mode service between Wi-Fi and cellular networks. With the advent of IP based infrastructure from the carriers, VoIP is considered to have a major impact to the mobile phone sector over the next few years, with a project growth of 18.6 billion dollars (See Fig. 6.) by 2012 (Macklin). Fig. 6 Macklin, Ben , Chart, “Convergence Frenzy: Mobile VoIP” eMarketer, Inc. 22 September 2006. < http://www.emarketer.com/Article.aspx?1004172>. The convergence of Wi-Fi and cellular networks is occurring with dual band devices. These enable the consumers to continuously pass between systems with no loss of connection or service for both voice and data (Hickins). In conclusion, the market potential of mobile commerce is not a question of if it will be realized, but a question of when. There still needs to be extensive research in usability studies for mobile transactions and standards need to be set with telecommunication providers and standards organizations’. Telecom analyst Jeff Kagan quantified the market by saying, “The mobile phone will be ubiquitous and carriers will offer a range of services to take advantage of the fact and generate revenue” (qtd. in Regan). The analogy that mobile commerce is like the “Wild West” of the United States is really a characterization of what the landscape of mobile technology portrayed a few years ago. What we are experiencing now is similar to the industrial revolution of the early 1900’s, emerging technology and service for the convenience of the consumer. As these new mobile technologies become established and consumers adapt to their usage, mobile commerce will enable the consumer to perform ubiquitous computing and will become a viable revenue driver within the United States market in the next five to seven years. Abbott, Laura. “M-Commerce”, 2001. MobileInfo, 21 Sept. 2006. <http://www.mobileinfo.com/mcommerce/index.htm>. Applequist, Daniel K., “Mobile Web Browsing gets WICD.” Informit.com. 02 Sept 2006. 14 October 2006 <http://www.informit.com/articles/article.asp?p=413465&rl=1>. Baker, Fiona. “Mobile Technology and Usability.” Nomensa.com. 31 August 2006. 15 October 2006 < http://www.nomensa.com/resources/articles/usability-articles/mobile-technology-and-usability.html>. Becker, Michael. “Academic Review: Mobile Marketing, Predictions for 2006” iLoop.com 11 January 2006 <http://www.iloop.com/news/mb_research_011106.html>. Bushe, Susan. “The Future Starts with M2M Payments.” Unisys.com. 06 October 2006 <http://www.unisys.com/communications/insights/white__papers/papers.htm?insightsID=86457>. Canny, John. “The Future of Human-Computer Interaction.” ACMqueue.com. July/August 2006. 15 October 2006 <http://www.acmqueue.com/modules.php?name=Content&pa=showpage&pid=402&page=1>. Cygnus Interactive. “Survey: U.S. Cell Phone Users Want Mobile Commerce and Biometric Fingerprint Protection” AMonline.com. 06 April 2006 <http://amonline.com/article/article.jsp?id=15877&siteSection=1>. Grami, Ali, and Bernadette H. Schell. “Future Trends in Mobile Commerce: Service Offerings, Technological Advances and Security Challenges” University of New Brunswick Libraries October 2004. Google. 28 Sept. 2006. Keyword: Trends AND “Mobile Commerce”. Gutiérrez, Jairo A. and Gordon Xu, “An Exploratory Study of Killer Applications and Critical Success Factors in M-Commerce.” Journal of Electronic Commerce in Organizations. Vol. 4. No. 3. : ProQuest Information and Learning Company, 2006. Hickins, Michael. “True Wi-Fi-Cellular Convergence.” InternetNews.com. 21 September 2006. 08 October 2006 < http://www.internetnews.com/infra/article.php/3633396>. Huynh, Minh Q., Len Jessup, and U.N. Umesh. “Creating Successful Entrepreneurial Ventures in IT.” Communications of The ACM. Vol. 48. No. 6. New York: ACM Press, 2005.
iGillottResearch, Inc. “Securing Mobile Devices on Converged Networks.” TrustingComputingGroup.org. September 2006. 15 October 2006 <https://www.trustedcomputinggroup.org/groups/mobile/Final_iGR_mobile_security_white_paper_sept_2006.pdf>. LoSoNet 2006. “First Location-Based Social Networking Conference A Success.” LBSzone.com. 10 October 2006. 15 October 2006 <http://www.lbszone.com/content/view/1320/2/>. Maitland, Carleen, and Ankur Tarnacha. “Entrepreneurship in Mobile Application Development”. Proceedings of the 8th international conference on Electronic commerce: The new e-commerce: innovations for conquering current barriers, obstacles and limitations to conducting successful business on the internet. ACM International Conference Proceeding Series; Vol. 156, 13 Aug.-16 Aug. 2006: 589-593. Macklin, Ben. 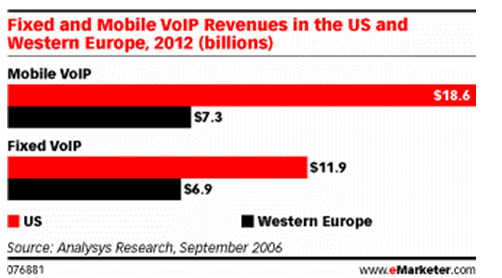 “Convergence Frenzy: Mobile VoIP.” eMarketer.com. 22 September 2006. 08 October 2006 < http://www.emarketer.com/Article.aspx?1004172>. “Mobile Spending in the US.” Global Technology Forum. The Economist Intelligence Unit Limited. 12 September 2006. <http://www.ebusinessforum.com>. Path: Research; Market Trends; more; Mobile Spending in the US. Motorola Labs. Human Interaction. 2006. 14 October 2006 <http://www.motorola.com/content.jsp?globalObjectId=6678-9298-9302>. Nokia. “Connecting mobile consumers and merchants.” Nokia.com February 2004. 21 September 2006 <http://nds2.ir.nokia.com/NOKIA_COM_1/About_Nokia/Press/White_Papers/pdf_files/connectingmobileconsumersandmerchants.pdf>. Regan, Keith. “Mobile Carriers Hope to Cash In With Wallet Phones.” eCommerceTimes.com. 13 September 2006. 29 September 2006 < http://www.ecommercetimes.com/story/46100.html>. Steinfield, Charles. The Development of Location Based Services in Mobile Commerce. In Preissl, B., Bouwman, H. and Steinfield, C. (eds. ), Elife after the dot.com bust. Berlin: Springer, 2004, p. 177-197 < http://www.msu.edu/~steinfie/elifelbschap.pdf>. The TCG. Trusting Computer Group Mobile Phone Work Group. The TCG. 2006. 29 September 2006 < https://www.trustedcomputinggroup.org/groups/mobile/>. Uncapher, Mark. “Mobile Internet Population Jumps to 34.6 Million, According to Telephia.” ITAA.org. 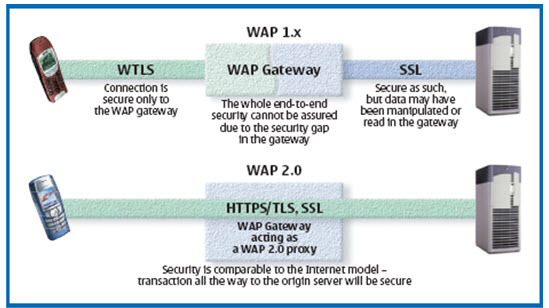 August 2006 < http://www.itaa.org/upload/isec/docs/e20068-04.pdf>. “WiMAX.” Wikipedia.com. Wikipedia Foundation Inc. 16 October 2006. <http://en.wikipedia.org/wiki/WiMAX>. Wobbrock, Jacob O. “The future of mobile device research in HCI.” CHI 2006 Workshop Proceedings: What is the Next Generation of Human-Computer Interaction? Montréal, Québec 22 April-27 April 2006 < http://faculty.washington.edu/wobbrock/pubs/chi-06-wkshp.pdf>. 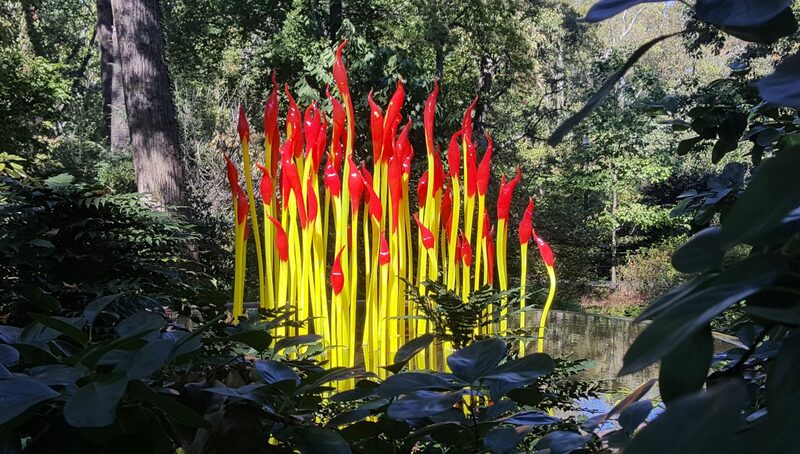 Previous PostPrevious Twitter Is Over Capacity – Again!